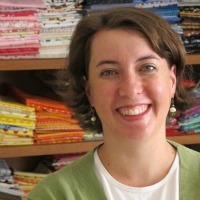 Today we’re chatting with Stephanie from Felicity Sewing Patterns. 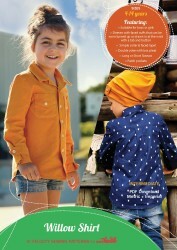 Stephanie submitted the pattern for the Willow Shirt to Issue 10. I live high up in the Blue Mountains where I grow the best tasting, totally organic apples and cherries in my monster garden. I have one grown-up daughter.I am now retired after 40+ years in the rag trade in Sydney as a designer, pattern maker and product developer. 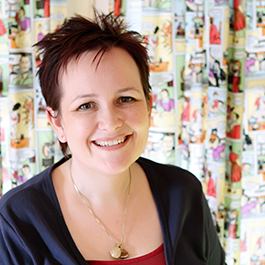 I started Felicity Sewing Patterns in 2012 because I wanted to have a more creative, fun and easier way of earning an income. As a bonus I enjoy the closer interaction with my customers. 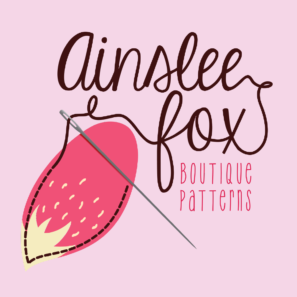 It’s great to know that my patterns are helping people to create their own lovely items. How did you get into pattern making? I have been sewing almost as far back as I can remember. My mother taught me to sew and to make patterns and sketch, she was always there to help me and I was very keen to learn. I went straight from high school to the National Art School as it was known in those days. I studied Clothing Design; this was the only course available back then if you wanted to work in the Clothing Industry as a designer. That was just the beginning. 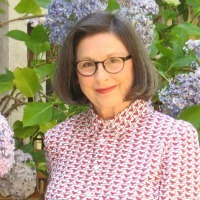 I spent the next 40+ years working as a women’s wear designer, pattern maker and product developer for many well know companies. I started Felicity Patterns in 2012 which meant learning a whole new skill base; actually I am still learning. I am interested in a lot of things and have a strong creative urge. I am a very DIY person and will try almost anything including building things. I renovated my old weatherboard house in Sydney before I moved to the mountains. The gorgeous picket fence around 3 sides of the front garden was my proudest creation. When I was 9 I built my own cubby house in the backyard and insisted that I was moving in there but mum ‘convinced’ me otherwise. I am an odd mix of artistic and practical. When it comes to pattern design if I am not ‘inspired’ to create a new pattern then I just don’t; I have to really like the design and it has to meet certain criteria before I will put the energy and time into turning it into a pdf pattern. I take more notice now of what kids are wearing and what is on offer in retail stores plus I spend much more time in fabric shops. I think you need a lot of patience and some good hands-on help to get you started so I would suggest taking introductory sewing classes. I believe most people learn much faster with someone to show them just how it’s done. Sewing tutorials and videos are great but hands-on is better by far if you are just getting started. Then it’s all down to practice to improve your skill level. What’s your favourite pattern/ thing you have sewn? What you are working on now? I don’t think I have an absolute favourite pattern and I am always itching to get onto the next new project. At present I am working on updates to most of my older patterns. I would like to freshen up some of my earlier items with new samples and promotion photos etc. I am a very keen gardener and I am a qualified horticulturalist. I really wanted to get out of the rag trade in my late thirties so I did a 4 year diploma course in horticulture but ended up never leaving the rag trade. Growing things has always been my favourite thing and my way to escape the pressures of work. or purchase Issue 10 which contains this pattern HERE. Thanks again for having me back Jen. 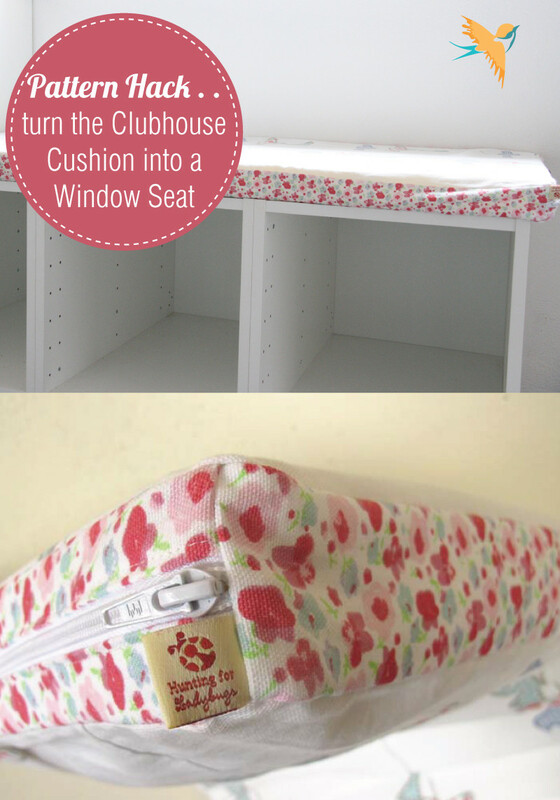 The last post in our ‘Week of Sarah’ is a pattern hack for the Clubhouse Cushion. A local farming friend has been updating her laundry. Now a laundry on a farm has to serve many functions. Not least of all is dealing with all the mud, dust and grease that comes home on farmer work clothes. This one also has a special spot for her kids to put their shoes on (oh to have children put their shoes on the first time you ask…..). There are cubbies underneath for each kid’s shoes and a long bench to sit on. 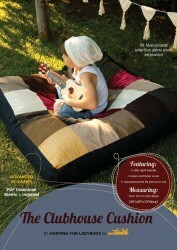 She bought a large piece of foam same size as the bench and some fabric she loved and asked me to make a cover. This is basically a Clubhouse Cushion. Different dimensions and inner filling but the construction was exactly the same. Hurrah to pattern hacks! She wanted to be able to remove the cover to wash it every now and again so I added the zipper panel on one of the short ends (bonus is that it didn’t scratch the back of legs there). I cut the panels the same size as the foam except to add 1”/25mm for my seam allowances. Simply sew the side panels together first into a big ring shape and then add the top and bottom, pivoting at each of the seams. I’ve also discovered that it’s easier to clip your corners of your top and bottom panels at a diagonal just short of the seam allowance. It seems to make wiggling them into position a bit easier. If someone has a better way of doing this, I’m all ears. Have you made a Clubhouse Cushion yet? Do you have a spot that could be easily updated with a covered foam pillow? Tell us about it in the comments below. Today’s blog post is a quick one. 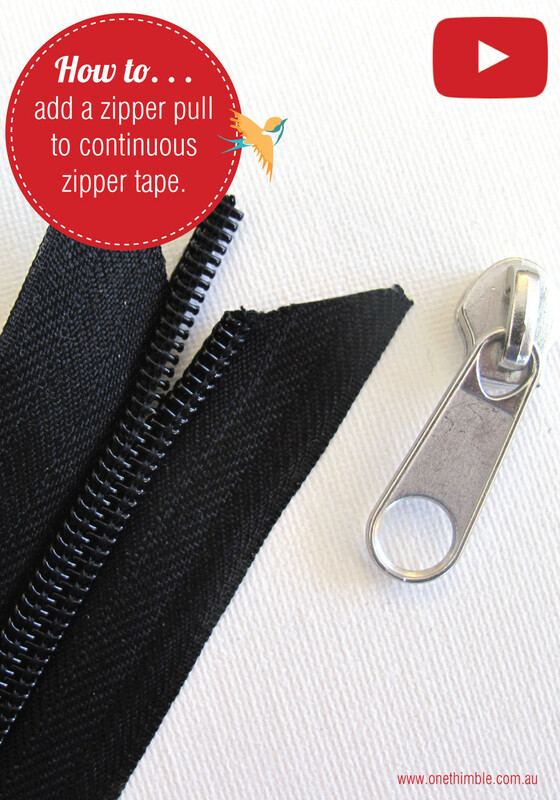 Sarah from Hunting for Ladybugs is sharing with us the “How to” for adding a zipper pull to continuous zipper tape. Click below to watch her video! You’ll use this when sewing the Clubhouse Cushion pattern in Issue 10. It’d also be handy if you wanted to make your own zippers custom length or custom colour using continuous zipper tape! Today we’re chatting with Sarah from Hunting for Ladybugs. 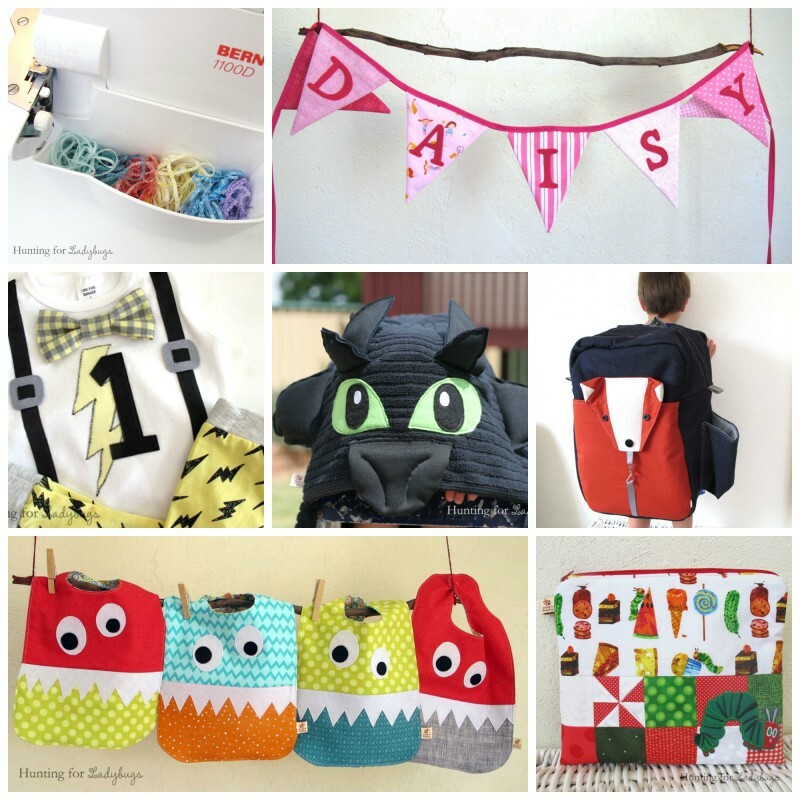 Sarah submitted the pattern for the Clubhouse Cushion to Issue 10 and the Make a Splash Backpack pattern to Issue 5. Sarah lives an idyllic life on a farm in Western Australia. see it, problem solving with fabric! I started sewing at Home Ec classes at high school. I still remember the tears of frustration over a four square patchwork pot holder that just wouldn’t line up in the middle. Argh! Despite this, the bug bit and I went on to compete in the WA Teenage Fashion Awards and hand make many gifts for my friends. I even made a quilt or two during the holidays. I left sewing for a while but got back into it again when a fellow Playgroup mum commented on my daughters hat I’d sewn. Etsy was gaining traction so I opened a shop. I enjoyed having a purpose to sew as well as the brain boost running an online business provided. I quickly learnt that sewing the same thing over and over really isn’t my thing (ug) so I moved my biz towards custom orders. Problem solving sewing is my absolute favourite and the best emails start with “I’ve been looking for a ____ everywhere but they don’t make one, can you help?”. I love curly requests that push me to mash elements of several patterns together and draft something completely new that fits the bill perfectly. Get that machine out of its box and just start. Pick something not too complicated but something that inspires you to make it. 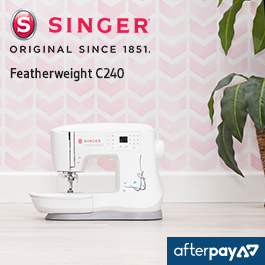 Don’t worry about wasting fabric or first-go wobbles, they haven’t run out of gorgeous prints yet and you’ll always get better the second and third time you sew something. 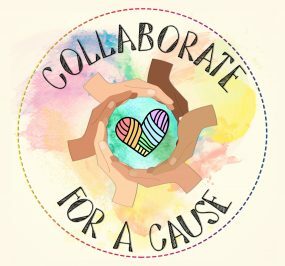 I love helping others to make that initial leap onto the sewing path. 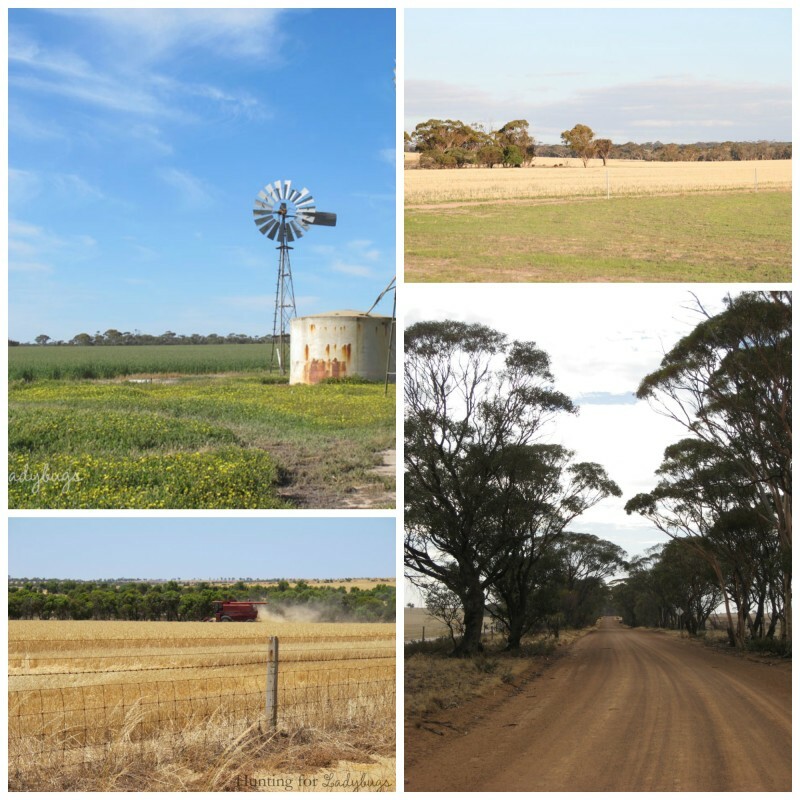 I live in the bush, out on a wheat and sheep farm, so I know getting to face to face classes can be tricky. I’ve designed a series of sewing project kits that I post all over the place. With some online support, I help people go from staring at that box to a beginner sewer. Love it! I’ve got a few custom orders to finish on my cutting table but the next big this is filming an e-course. I’m a practical girl so I wanted the foundation sewing skills I’ll be teaching as part of the course to be immediately applied to an item you can love and use at the end of the course. We’ll be making a large beach bag that will not only help to cart around the towels, snorkels and buckets and spades but also teach you how to cut fabric, sew straight seams, topstitching and handle construction. Sign up to my newsletter list hear more. Stay tuned for two more posts from Sarah this week – she’s filmed a video tutorial on how to thread the pull onto continuous zipper coil and a pattern hack to make a window seat cover. You can purchase Sarah’s pattern for The Clubhouse Cushion as a single PDF HERE or visit her website to see more of her sewing patterns HERE or purchase Issue 10 which contains this pattern HERE. Just when you thought Alana from Rosie Petal’s Enid Slouch Beanie pattern couldn’t get any better she’s added an elastic back pattern hack! This to . . . . this! 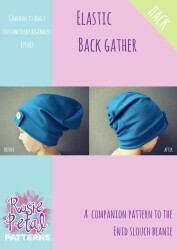 Download your free pattern hack add-on ->Hack-Elastic-gathered-Beanie-by-Rosie-Petal and get sewing! 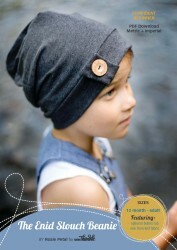 You’ll need a copy of the Enid Slouch Beanie to make this Beanie. 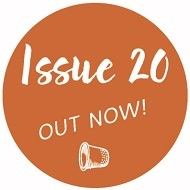 You can get your copy as a stand alone HERE or in Issue 10 HERE.